The High School Musical star may not be the only big-name actor eying the live-action adaptation of landmark cyberpunk anime film Akira. If there is any one anime that people who don't watch anime have heard of, it's Katsuhiro Otomo's 1988 movie Akira. This past weekend, we heard rumors that High School Musical heartthrob Zac Efron was being considered for the leading role in Hollywood's live-action adaptation of the dystopian classic. While attempting to confirm said rumors regarding Efron, Bloody Disgusting learned of whispers about another interesting casting choice for the movie: Academy Award winner Morgan Freeman is said to be interested in the role of the Colonel. The Colonel is the badass soldier who is the head of the secret military project running experiments on human psychic powers, who is torn between his duty hunting for biker rebel protagonist Kaneda and his increased disillusionment with what the military is doing. 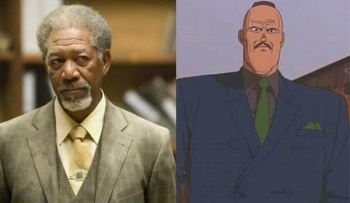 Despite the two looking nothing alike, casting Freeman as the Colonel makes more sense the more I think about it - it's the exact sort of role he's developed a reputation for lately. The Colonel is older and wiser than the rest of the characters, and a morally ambiguous character caught between doing his duty and doing what he thinks is right. An actor like Freeman might be a great pick for a role like that. It makes more sense than Zac Efron as a tough biker gang leader, anyway. Nothing against the guy - he's actually a pretty decent actor - but nothing about that face strikes me as "tough." Light in an adaptation of Death Note? Sure. Kaneda in Akira? No, not so much.